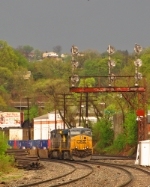 Description: This is a cropped or closer-in view of CSX 453. Everything else remains the same. Description: CSX 453 and another six-axle GE bring hopper cars along Second Avenue in Huntington, WV on a July afternoon. The floodwall, built around 1947, is to the right (north) of the engine, and the Ohio River is about 300 yards further away. During this era (2005), there were at least two separate rail-to-river coal handling facilities. One is just to the left of this photo, with a multi-track yard and formerly a GE 45-tonner switch engine to handle the movement. I don't remember that company's name. About a mile behind this train, and in fact it may have been coming away from there, was a similar operation owned by the Ohio River Company. They had at one time several Alco units, including an S-2, RS-1 (since scrapped, according to a friend who used to work there), and a C-415! Sadly, that operation is no more, as all the tracks in that yard were taken up sometime between 2005 and 2012. Description: Here is a close-up of the cab, showing the number, lightning bolt (which used to signify the engine was radio-equipped), the GE Model number or class and a small American flag. The lines of separation between the paint colors are very crisp. Description: Q110 approaches CP-5 with a train of hot UPS traffic. Description: After being broken down for some time, Q300 gets along on the new track behind a YN3 SD70MAC. Nice. Description: CSXT 453 leads Q62001. Description: CSXT Q512 departing Osborn Yard. Description: A loaded coal coming into Corbim from the CV line. 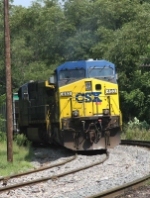 Description: A CSX northbound manifest is seen leaning into a curve. Description: A colorful consist heads west through Naperville. Description: This train would later take the connector track in Olathe, KS and head south on the ex-Frisco Fort Scott Sub. Description: Southbound BNSF manifest arrives in Thayer for a crew change with a colorful lash-up. Description: Southbound manifest rolls through King Arkansas behind a Ferromex Gevo. Description: KCK-MEM heads for Memphis at sunset behind a Ferromex Gevo. Description: CSX AC44CW 453 leads Q235 (Louisville Ky. to Tampa Fl.) through Glendale. CSX 7640 is trailing.